BACKGROUND: Syrian Beancaper is native to the Syrian desert and westward to the Mediterranean Sea. It spreads by seed and in some conditions by creeping roots. It is well suited to dry environments. 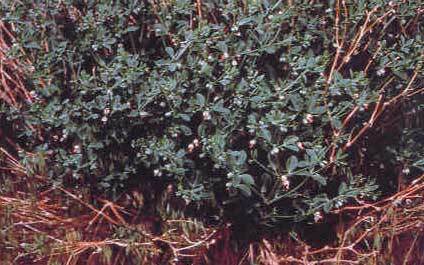 DESCRIPTION: Syrian Beancaper is a perennial that may act like an annual in regions with harsh winters. 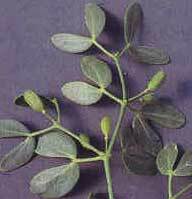 Leaves are somewhat succulent, opposite, and compound, each having 2 oval,1-inch leaflets. Stems are smooth, thickened, and up to 1½ feet tall, giving the plant a bushy appearance. Flowers are borne singly or in pairs from the leaf axils, salmon to yellow or white with pinkish veins, and up to ¾ inch across. 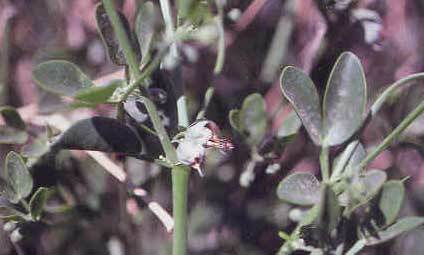 Flowering occurs from April to June. Seed pods are oblong, up to 1½ inches long, 5-angled, and ribbed; each contains several oval, ½ inch long, gray seeds. Buds on horizontally spreading, brownish-orange roots germinate to form dense patches. DISTRIBUTION: Syrian Beancaper has been reported in several western states and in selected Idaho counties shown. CONTROL: No biological control agents are available to control Syrian Beancaper, but herbicides are available that can control this weed.